Major was diagnosed with DM in February 1997, but he had started showing symptoms in July 1996. 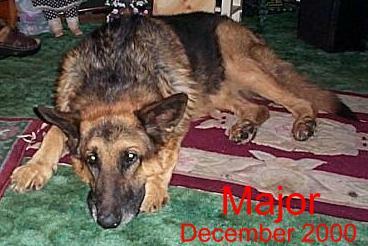 Major went through several periods of remission, then in January 2000 he became very weak in his hind legs. He was put on Prednisone which seemed to help a little. 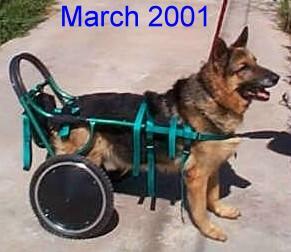 Then on April 4th 2000 Major was put onto LDN, which is intended primarily to halt the progression of the disease. But there was some limb improvement within 4 days. He began to wag his tail. When he came into the house, he would pick up his feet to cross the threshold, where as before that, he would only drag across it. Major still continues to pick his feet up when coming in the door. He is still walking and runs occasionally. He sometimes walks with a drunken gait, and other times without much trouble. Some owners of dogs that are already down have tried them on LDN, and have reported that they did not seem so depressed. That was another thing that Pauline noticed, Major never seems to have a depressed day anymore. Many thanks to Pauline for sharing her experiences of LDN and for providing the photographs of Major. 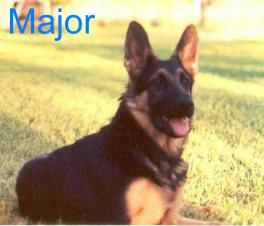 I am deeply saddened to have to add the news that Major passed away on 08/08/01. This is an experimental drug and is also used for MS sufferers. It comes in a 3mg capsule that is usally given at night time. LDN has been used in an attempt to slow the progression of the disease, it is thought that it helps to boost the immune system. There is not supposed to be any symptom relief, however some have reported this, both dogs and people. Other dog owners have reported seeing no improvement what so ever following this treatment. Spanna.net in no way endorses this medication, we do not supply, sell this or any other medication. We stronly recommend that you seek professional veterinary advice before the use of any medication or treatment. 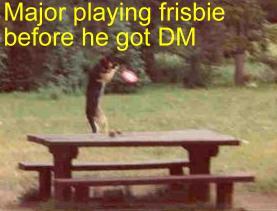 A friend of mine gave LDN to her dog Major, who had DM.